Aaron Brown's views on the role of quantitative modeling, the use of data and the outlook for the risk profession are largely in line with those of the risk educators. Risk Management programs have some basic elements in common, but each pursues a unique path or mission designed to interest students of differing backgrounds at a given career stage. Models can't predict themselves...there has to be data analysis that drives the models, rather than a theoretical construct about how financial data and financial instruments should behave. 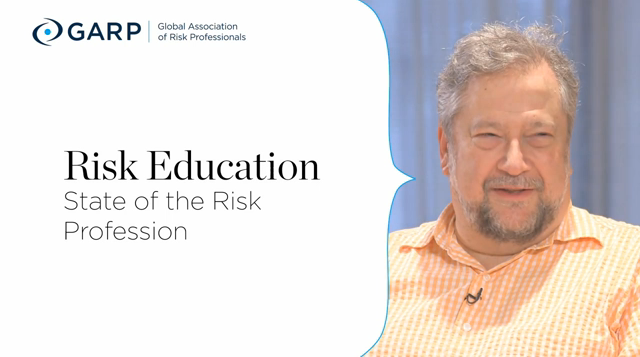 The crisis of 2008 destroyed smugness, and its ramifications affected not only the risk management profession, but the demand for risk education and the way it is approached and delivered. Emanating from the schools is an air of optimism about the future of the risk profession - although it is not taken for granted. Aaron Brown provides a contrasting perspective to the subject matter of "The Educators Speak." As the only globally recognized certifying body and membership association for risk managers, the Global Association of Risk Professionals (GARP) sets the standard in advanced professional designation, career development through education, and the promotion of best practices globally. Through our testing and certification, education and training, media, and events, GARP helps create a culture of risk awareness within an organization, from entry-level to board-level.